Over ten years ago, Bling Tie Affair owner Patti Pollack discovered her niche, “bling” ties. 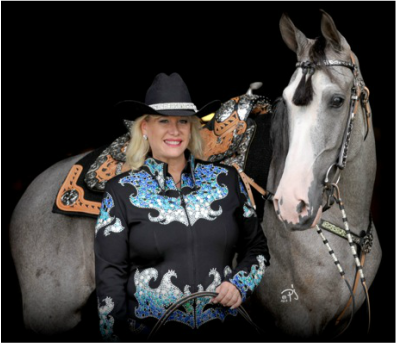 She began creating one of a kind designer ties with Swarovski Crystals for herself to wear while competing around the world with her horses. She created such a buzz in the show ring that she had to start making ties for other equestrians. Pollack has been in the retail business since 1985. This tie guru prides herself on being able to put outfits together that most would have never thought of. Many people send photos or fabric swatches of their riding suits and leave it up to Pollack to create and match the perfect tie. Since then, Bling Tie Affair has grown into the largest authorized dealer of Dale Chavez Custom Saddles and Tack. Pollack personally helps customers design the perfect individual look for their horses, which encompasses: saddles, headstalls, breast collars, saddle pads, reins, and show halters. Pollack has also created a line of custom Swarovski Crystal English browbands to match the riders' suits and colorful ties. Recently, Pollack has transformed her love for oil painting into a line of hand painted leather goods.